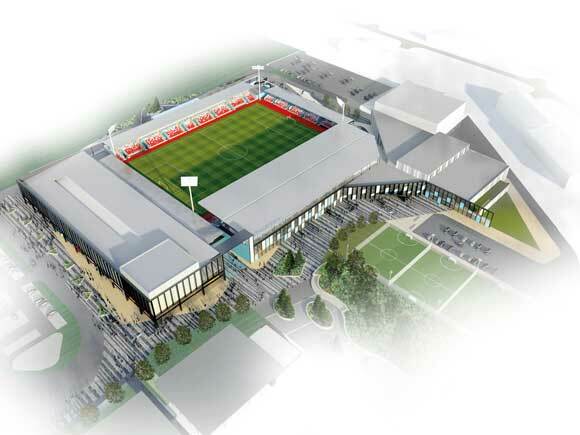 York’s Community Stadium will host football and rugby league, as well as providing an array of leisure facilities and a 13-screen cinema. Martin Cooper reports. Steel tonnage: 3,000tYork’s professional football and rugby league teams (York City and York Knights), will both have a new home to share from next summer as an 8,000-seat stadium, including leisure and cinematic facilities, is currently under construction at Huntington on the city’s outskirts. As with many similar high-profile sports projects, getting the scheme under way has been a long and difficult process. From their original involvement in the project some five years ago, Buckingham Group was appointed, and started on site, late last year. It is scheduled to handover the stadium in time for next year’s rugby league season which kicks off in May. Buckingham inherited the site from a previous project team with the site already cleared of its previous buildings, which included an athletics track and a swimming pool, while all of the enabling works had also been completed. “To ensure the scheme got under way this time we initially undertook a value engineering exercise of the original design, streamlining it and making it cost-effective and buildable,” explains Buckingham Senior Project Manager Alan Domville. 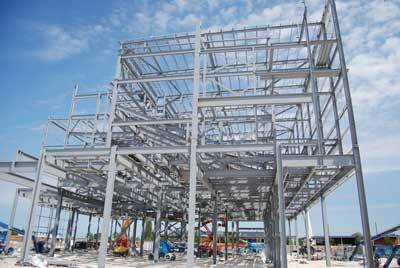 Working in conjunction with Caunton Engineering, who are the design and build steelwork contractor for the project, the value engineering included a complete design review of the steel frames for the scheme. One example was replacing precast planks with metal decking in the cinema seating areas, as it offers a more efficient build solution for the follow-on trades. Another was using Westok tapered cellular beams for the stadium’s cantilevering roofs. “The original design for the stadium roofs was for solid UB rafters. By changing to Westok beams we have lighter and less expensive members, and ones that are tapered at no extra cost to give a more aesthetic appearance,” explains Caunton Engineering Senior Structural Engineer Richard Beesley. Overall, structural steelwork is being used to form the entire stadium project, which consists of three main elements; the cinema block that adjoins the stadium’s south stand, the east stand which also includes a two-storey building housing an NHS drop-in surgery, a library and the stadium’s corporate facilities on the upper level, and a leisure block that adjoins the scheme’s north east corner and includes three pools, a gym and a sports hall. All three of these main structures are independent and separated by movement joints. These parts of the scheme are all founded on piled foundations, typically 13m-deep. The remaining parts of the scheme, which consist of the smaller west and north stadium stands are on pad foundations, as these structures are much lighter. Steelwork erection began in March, with Caunton Engineering working on two fronts, with one gang erecting the cinema and the other building the leisure centre. The leisure centre gang then progressed on to the stadium. The 13-screen cinema, which includes an IMAX, measures 44m-wide x 123m-long and is 24m-high. It is a braced box and sits above a ground floor retail level, which has a completely different grid pattern to the more complex arrangement needed for the two upper levels. The retail floor features long clear spans, ideal for shops, while the cinema’s two floors are a forest of beams in comparison, needed for the screen’s and projection room’s partition walls. A series of transfer beams is installed at first floor level to support the more numerous columns of the cinema. Caunton used plate girders, as these could be fabricated in a slender form to the maximum permitted depth of 950mm. “The depth of the beams was important as the retail floor below them needed to have a 7m floor-to-ceiling height to allow a mezzanine level to be installed if it was needed in the future,” adds Mr Beesley. A movement joint and acoustically treated walls divide the cinema from the south stand’s terracing, but the final four bays in the south-east corner are structurally connected. This area houses the ‘fans zone’ a large covered area where supporters can gather for refreshments, before and during a game. It was important to have no intrusive columns in this zone, and so to help create this open-plan zone the structures are linked via perimeter columns and roof beams. Erected at the same time as the cinema, the project’s leisure block is a large wedge-shaped building containing two open-plan zones, accommodating an aquatics zone and a sports hall, sandwiched either side of a two-storey section containing changing rooms, a gym, offices and dance and spinning studios. The sports hall, which has a spectator terrace along one perimeter wall, will be used for netball, basketball and badminton. 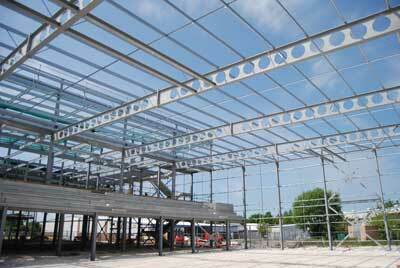 A series of 25.5m-long roof rafters, spliced at midpoint, creates this large column-free space. Similarly, the aquatics zone, which houses a six-lane 25m-long main swimming pool, a smaller learner pool and a further splash pool, is spanned by a series of 18m-long beams. Sat between the leisure centre and the cinema is the east stand structure. As well as being the stadium’s main stand, housing changing and pre-match facilities on the ground floor beneath the seating, it also houses, at the rear of the structure, restaurants on the lowest floor, an NHS drop-in centre on the first floor and corporate facilities on the second level. Like all the other three stands, the east stand features a single tier of terrace seating, formed with raking steel members supporting precast flooring terrace units. The east stand is slightly larger than the other stands, at 19m-deep, and features the largest of the four cantilevering roofs. The south and west stands both have 13m-deep cantilevering roofs, while the north, which is the stadium’s smallest stand, has a 6.5m-deep cantilevering roof. The Eurocode design of the stadium included full dynamic checks on the roof and terracing, undertaken by Caunton Engineering. Summing up, Wrenbridge Sport Project Manager Peter Baird says: “We’ve been part of the consortium with leisure operators Greenwich Leisure (GLL) for the past five years that has worked very closely with the Council to make the scheme a reality. “We are the developers for the enabling commercial elements of the project that has been funded by Legal & General and includes a 13-screen state-of-the-art IMAX cinema, five restaurants as well as retail and leisure uses.